We have not been idle since first addressing the matter of our stuff. Our old electronics have been on our minds for a long time. In the past week, we took action. There were old laptops, an ancient CPU, two printers, the remains of our former home security system (control panel and room alarms) to name a few. 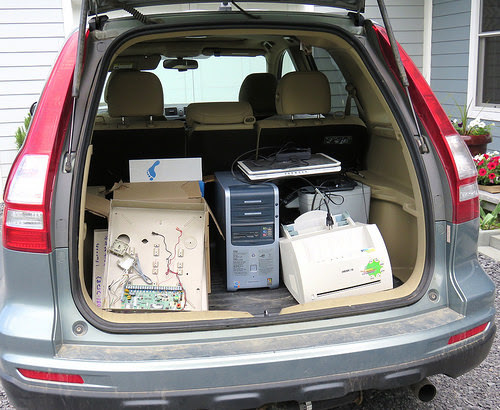 Our local Chamber of Commerce hosts an electronics recycling program – kudos – and we loaded up the back of our CRV. But, it occurred to Ray that the hard drives should be removed and cleaned first. He contacted our local IT gurus at SCT, who service our equipment and our ignorance. Ray discovered that SCT would not only deal with our hard drives, but would also recycle the computers and our old printers as well. We hope they will be refurbished and sold back into the community. So our first stop was at the guru guys, then it was off to the Chamber. We returned empty. We also had our first flat screen TV taking up space in our guest room ,which is not set up for cable reception. Younger daughter was an option, but we have opted to gift her and our son-in-law with a new one as the house-warming gift for their new home. So, the TV has been given to our church, which has been working with an unwieldy cathode ray TV, vintage unknown. And, as we head south to see younger daughter’s new home, we will be taking two Breuer chairs that we bought in the early 70’s in Cambridge, MA. Our daughter is a chair afficionado of long-standing and is eager to have these vintage knock-offs of the real thing. It’s progress, and we are grateful to our visitors for lending a new imperative to keeping at it. We’d like to hear how you are attacking the stuff. This entry was posted in The Stuff on June 9, 2015 by Donna Copson.